Burravoe lies at the south east corner of Yell. 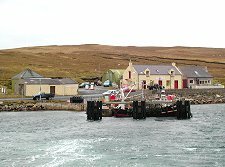 It is bypassed by most visitors to the island who stick to the excellent main road leading from the Mainland ferry terminus at Ulsta to the Unst ferry terminus at Gutcher. Which is a shame, because Burravoe is, in many ways, the most attractive settlement on Yell. It overlooks the sheltered inlet of Burra Voe which explains its origins. The harbour has been in use since the 1500s though the oldest building visible today is the Old Haa of Brough, dating back to 1672. 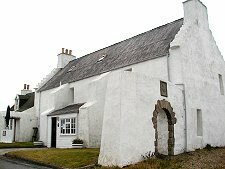 This white-harled building was erected by merchants where they could look across the entrance to Burra Voe. The Old Haa remains in use today, as a museum. The road to the shoreline used to run through gateways either side of the Haa's courtyard. When the road was improved it was built through what had been a range of buildings on the opposite side of the courtyard, leaving the original gateways intact, if now disused. In the centre of the village is St Coleman's Episcopal Church, built in 1900. This is a beautiful building that does much for the look and feel of the village as a whole. 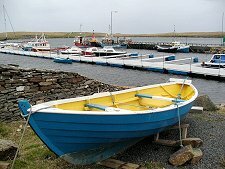 A new marina and harbour has been built in recent years a little to the east of the centre of Burravoe, and is accessed by a new road. This is an attractive spot. As you look back towards the centre of the village your attention is caught by the Manor House, built in the 1800s and having more of a sense of southern England than northern Shetland. 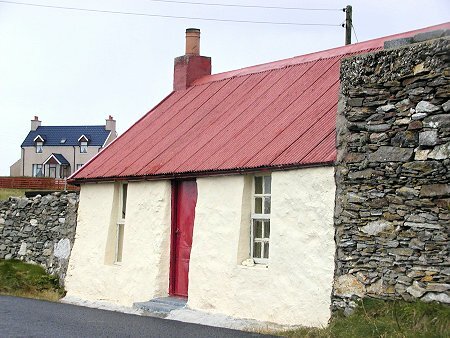 Also especially striking is the white painted red metal roofed cottage seemingly built into a wall on the edge of the village. Burravoe was a regular call on the timetable of the Lerwick steamers that served Yell and Unst until 1950. And from 1956 a regular passenger ferry connected Burravoe with Mossbank on the Mainland. By 1987, however, the ferry terminus had transferred to Ulsta. 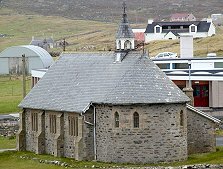 Heading west from Burravoe brings you to the scattered settlements of Houilland and Hamnavoe, the latter home to the striking St Magnus Kirk built in 1839 which these days appears as the end point of a long straight stretch of road. Ulsta itself is a tiny settlement crowding around its small harbour and ferry terminus. 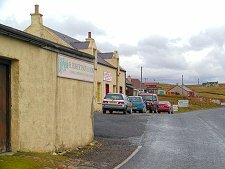 Heading north from Burravoe leads you past a series of road ends leading to small coastal settlements such as Gossabrough, Otterswick and Queyon. At Queyon you can see a memorial known as the White Wife, based on a moulding of the figurehead of the German training ship Bohus which was wrecked here in 1924. Beyond you have a choice of roads, minor or still more minor, that lead you north to Mid Yell.